This Gym Master 2700W Crazy Fit Vibration Massage Plate can be a lot of fun when users get used to the different settings and features. The design and functions of this device are there to draw in people that may be put off by the complexity of a treadmill workout. That is why users can set this device to their chosen speed level, enjoy a 10 minute session and not have to worry too much about anything else. Some will use the resistance bands for added toning or try different poses. Others will stand there and let the vibrations do their job. There are 120 settings to choose from, a handy remote control and a Bluetooth speaker for a workout playlist. 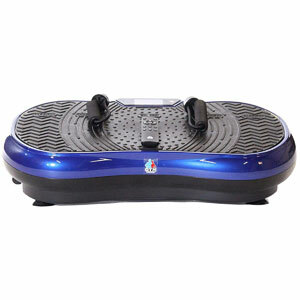 Like many other top vibrations plates for the home, this Gym Master Crazy Fit model is also quite compact. This means that users have no problem picking it up and storing it in the cupboard. The transport wheels are a nice touch for those that just want to roll it back under the bed when they are done. The problem with this Gym Master 2700W Crazy Fit model is that it isn’t the most intuitive machine on the market. Ease of use is important with these machines. It is why so many people turn to these vibro plates over other workout machines in the first place. Unfortunately, there are some issues with this model. First of all, there are those that love the design of the remote control, but struggle to control their workout when using the resistance bands. Users have to choose between diversity of settings or diversity of movement – they can’t really have both. Then there is the added issue of a lack of instructions. The manual doesn’t offer much insight into the different options and best workout routines. 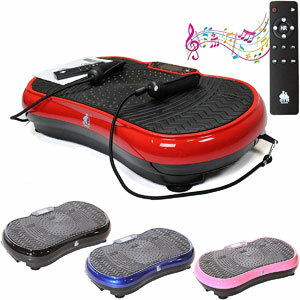 What is the final verdict on this slightly confusing Gym Master Vibration Massage Plate ? There is one obvious alteration that the manufacturers of this device can make when updated it. A more comprehensive manual and workout guide should prove to be of great help to those struggling to make the most of the system. The bare bones of the hardware and vibration are great. The tools are in place with this Gym Master vibration plate to allow users to lose weight, tone up and have fun – they just need to understand how to use them. Find more reviews about the Gym Master 2700W Crazy Fit Vibration Massage Plate on Amazon here.